The writing group at SWC is a place where students, faculty, and staff can come together and share in a communal free-writing experience each Thursday at noon. Patterned after Natalie Goldberg’s exercises, we start with a prompt of some sort and write for a few minutes, then, if we want, we share what we wrote. Those who are listening as each person reads then reflect back words or phrases that had meaning for them. There is no critique. We simply witness and reflect each other’s words back to the group. There is great power in being heard and also in having your words mirrored back to you. I had the great honor of leading the group one day because Ann Filemyr, Ph.D., the creator and facilitator of the SWC Writing Group, was not able to be there. I decided to play with the idea of spontaneity and connection with our prompts. We did two writing sessions within our hour together. The first prompt was a box of crayons. We passed the box around the room and each of us picked a crayon without looking. That randomly chosen crayon was the prompt. We were free to choose anything about that crayon to inspire the direction of our writing. My crayon was “midnight blue” and I chose to write with my crayon. I even chose to doodle, which I had never done before in writing group, but it was so much fun! Others chose to use the name of their crayon (and crayons are very creatively named these days!) Some chose to write about how crayons made them feel, or the color of the crayon. 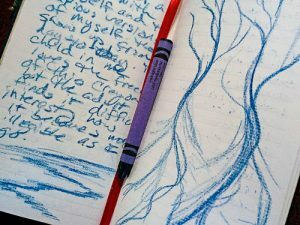 I focused on how it felt to write in my journal with a crayon instead of a pen. The second prompt involved writing down at least two words or phrases from each person who read what they wrote about their crayon. Any word or phrase that stuck out to you, but I asked that we all write them down as we were going. Once we were finished reading I asked each of us to take the words and phrases we had written down and spend the next 7 minutes to string them together as our next writing prompt. 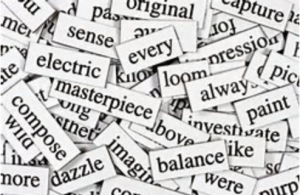 The idea is that we would each create something using the collective words of the group. The results were eerily haunting and beautiful. When filtered through the listening ear, our words combined and recombined into writings none of us would have come up with individually. It was a truly bonding and meaningful exercise to hear our words woven into such tapestries of awareness. Here are a few of our writings, all used with permission. Last names are initials only to protect the privacy of each participant. The deep red gorgeous earth is constantly caressed by the ball of orange that forever create a deep experience that leaves on the other side the child in me that desires to be the voice of change, though currently stuck, will create an altered experience for others through the dip of ruby to the journey beyond the horizon I will take you away with me because when accidents happen what we think is bad is really that I’ve arrived in the deep gorges. story is not yet seen. Are you the voice of change? That’s what the crayon says. You might not be so weird. is the color of smog. expel it from my life?